You are here: Home / Money / Business / What To Know If You’re Traveling to the U.S. for Business. What To Know If You’re Traveling to the U.S. for Business. (ThyBlackMan.com) There’s a lot of different things going on in the U.S. currently and many of them deal with immigration and being able to travel to America for work and other purposes. As with traveling to any country, there are visa and entry requirements to be aware of. There are also unique business culture issues to contend with. 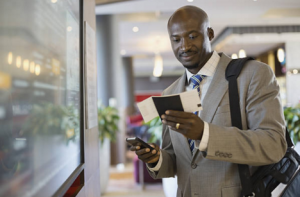 With robust corporate expense management software becoming available, as well as an increasingly globalized marketplace, it’s common for employees from around the world to travel abroad for work. So, if you’re from outside the United States and you’re going to be traveling there for a corporate business trip, what should you know in terms of visa and entry requirements? One of the biggest issues a lot of business travelers face if they’re coming to the U.S., especially from countries like Canada, is that they say they’re going for tourism. Some people, particularly from countries that participate in NAFTA, may say they’re going to the U.S. for tourism just because they don’t really think their reasons for going will be scrutinized. That can make some big travel hurdles. If you’re going to the U.S. and you’re speaking with Customs and Border Protection, you need to tell them exactly why you’re going, rather than making a broad blanket statement that might not be an accurate representation. If you’re going to travel to the U.S. temporarily for business purposes, there are different categories of nonimmigrant visas. The reasons you’re going to be traveling, specifically, determine the type of visa you need. First, know the term Business Visitor Visa B-1. This is travel which is permitted for business purposes. * If you’re coming to take orders, negotiate contracts, or do any kind of sales, these items must be produced outside the U.S.
* If you’re coming for a training program and you’re using a B-1 visa, the program you’re participating in shouldn’t be designed to provide employment, and you can’t receive income from a U.S.-based company beyond expense reimbursements or an expense allowance. If you’re applying for a B-1 visa you will need to speak with a U.S. Embassy or Consulate located in your home country. This is where you apply and your eligibility is determined. If your employer is based in the U.S., they will work with the Department of State Business Visa Center. If your company is located abroad, this is when you work with U.S. Embassies and Consulates. It’s likely if your employer is sending you to the U.S. they’re already working with the U.S. Embassy or Consulate. It’s important to note that if you’re seeking to work in the U.S., it’s a very different situation and you’re not eligible for the B-1 visa. Instead, you would need to apply for a temporary worker visa.